It’s Day 6 of the Blog Design Series, and I have another super great tutorial for how to set up a custom domain email via Gmail, brought to you by Cameron McIntyre, my favourite tech guy. He also wrote another informational post earlier this week. Take it away, Cameron! One thing that really sets gives someone a strong online image is a â€œpersonalizedâ€ email account tied to their domain name. In my case, this is [email protected] Unfortunately, this often means dealing with the webmail that comes with your hosting provider, which is never very good. Most people are simply content to have their emails forwarded to a Gmail or personal email address. Once the email is forwarded however, you can’t reply from the personalized address anymore. Wouldnâ€™t it be great if you check your personalized email right from within the Gmail interface and reply as well? Good news â€“ you can. With this little-used feature in Gmail, you can check multiple email accounts at once and even reply without ever having to leave the comfort of Gmail. It is really easy to set up too. 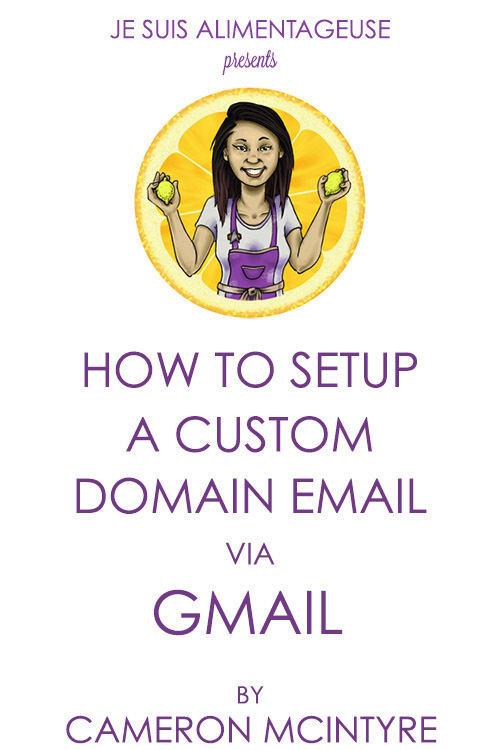 For this trick, you will need to already have a personalized email account with your domain. If you donâ€™t know how to do this, contact the company that hosts your website and they will be happy to help. You will also need the setup information to access your email via POP3 (again, hosting companies will often have this information online already, simply Google â€œPOP3 *insert hosting company here*). Once you have all of this, log in to your Gmail account and go to your settings. The fourth tab at the top of the page is â€œAccountsâ€ and on that page you will see a section titled â€œCheck mail from other accounts (using POP3)â€ and it will give you an option to add a POP3 account that you own. Click here. After this step, the wizard will ask if you wish to be able to send mail from your personalized address. As this is the point of this tip, the choice is obviously yes! When asked if you want to â€œTreat as an aliasâ€ make sure to Deselect this. When deselected, this will ensure that when you reply to emails, they will come from the address they were sent to. (More info and an example can be found here). The final step requires you to send through your own SMTP servers (and NOT through Gmail). Keep following the wizard and enter your information as prompted. You will receive an email from Google asking you to confirm that you do in fact own the email address you are trying to set up. Once you click the link in this email to validate your ownership, you are all set to go! Try composing a new email, you will now see the option to choose who the email comes from. Now that you have this done, there is no excuse not to use that personalized email. Use it to help you separate blog-related emails from personal ones, or simply to increase your online presence. With personalized email on your own domain, everyone will pause and take notice of you! Hi Holly, I'm glad to hear that I could help. With the way that Gmail fetches your email I do not think that it will find your old folders. You can however put these emails into a folder in Gmail. I am having an internship and I was looking for the solution. But thank you so much for sharing this.